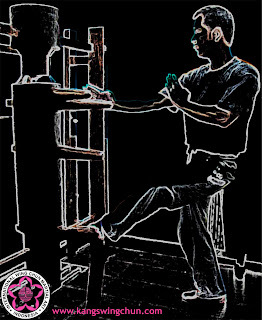 The Muk Yan Jong form is taught when a Wing Chun Practitioner has mastered the initial 3 empty hand forms, which are the Siu Nim Tao, Chum Kiu, and Biu Jee. When start practicing the Muk Yan Jong form, one may find that the earlier forms that one has trained for many years will become difficult to be used, as the Muk Yan Jong will destroy all of the skills that one has gained and reform it all over again. 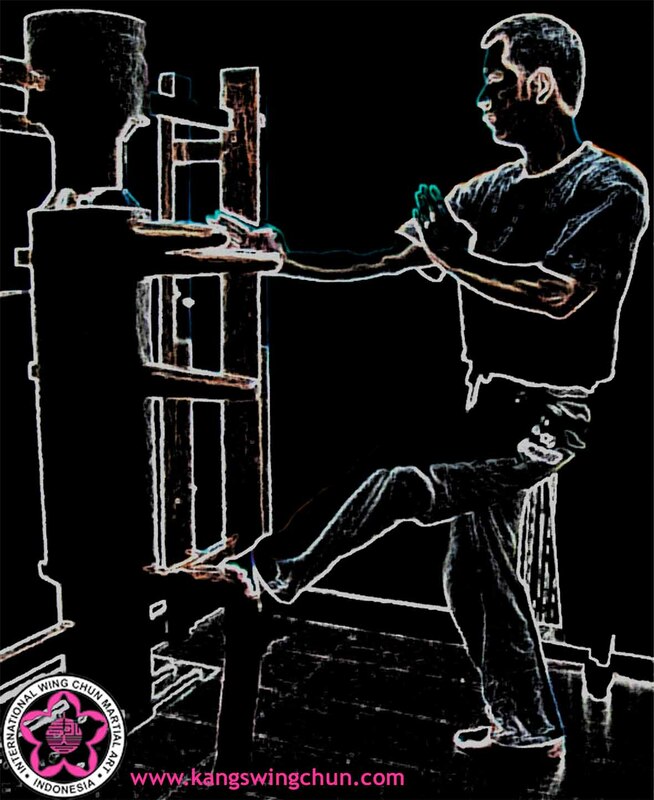 A Wing Chun Practitioner will have to move his/her body positioned against the Muk Yan Jong all the time by having the correct posture and foot work so one can attack and defend with the utmost efficiency and precision. In addition, the Muk Yan Jong gives a Wing Chun Practitioner a constant and loyal partner on which one can maintain his/her standard through frequent practice. Another reason why the Muk Yan Jong is the perfect tool for a Wing Chun Practitioner is that because we can almost never or very difficult to practice our movement correctly against another human being since the opponent will always move in reaction to ours (action vs. reaction). It’s very important to know and for the body to remember exactly the correct body posture and position so when one fights against an opponent, he/she can use the correct and efficient body posture, position/footwork, movement, and energy. Lastly, we can’t “always” practice the deadly blow against a living partner and thus the Muk Yan Jong is the ultimate practice partner a Wing Chun Practitioner must always have. 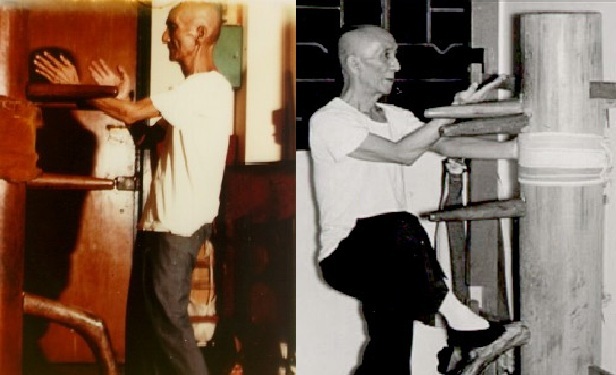 Initially, the Muk Yan Jong form consisted of 108 movements as taught by the late Great Grand Master Ip Man. Along the way, his disciples restructured the Muk Yan Jong form into 116 movements, 132 movements, and so on. In one of Ip Chun’s book published in Germany, the Muk Yan Jong form consists of 116 movements and Ip Man’s first disciple in Hong Kong, the late Grand Master Leung Sheung, even broke the Muk Yan Jong form into many sections. 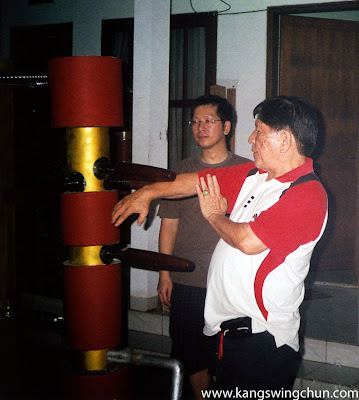 The later was then taught by the late Grand Master Kang Sin Sin to his loyal disciples in Indonesia. The main reason why the section type Muk Yan Jong form was taught by GM Kang Sin Sin was because it’s easier to be remembered and practiced by someone who is just started to learn the Muk Yan Jong form. The section type Muk Yan Jong form is also very helpful for a Wing Chun Practitioner to monitor his/her movement and to keep fixing his/her body posture and position when found displaced. 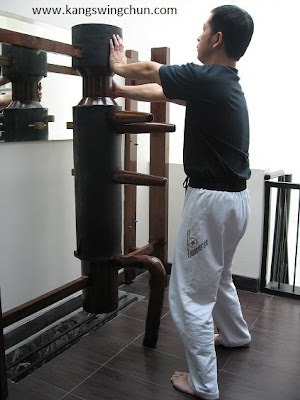 Nevertheless, once a Wing Chun Practitioner has mastered the art of Muk Yan Jong, he/she can always choose to further practice the Muk Yan Jong form into the continuous type of the form. The Late GM Kang Sin Sing made the Muk Yan Jong (mostly for his disciples) with the correct measurement and highest precision anybody can find in a Muk Yan Jong. The Muk Yan Jong was made from the Jati wood (one of the toughest and highest quality wood in the world which can only be found in Indonesia) and the height of the Muk Yan Jong was always measured in accordance with the owner’s body height. There can never be a standard size Muk Yan Jong for everybody as the Muk Yan Jong’s height must comply with the owner’s height. So this is why a person’s Muk Yan Jong may not be convenient to be used by others. The Muk Yan Jongs made by the late GM Kang Sin Sin always had the correct upper hands distance as created by the perfect tight angle of both upper hands (and that’s why it’s difficult to practice against the late GM Kang Sin Sin’s Muk Yan Jong) and the correct distance between the upper hands and the lower one. The foot of the Muk Yan Jong was made from a one-piece wood normally found in a root of a tree in order to provide the utmost strength over time. The neck of the Muk Yan Jong was made as it was a human’s neck in order to create the feel of the actual neck, and the head and body parts of the Muk Yan Jong were covered with thick sponge internally and leather externally to reduce the injury possibility of a Wing Chun Practitioner when he/she practicing the form. In addition, this leather covered head and body parts will also greatly help a Wing Chun Practitioner to practice punches, palms striking, kicks, and hard pushes. 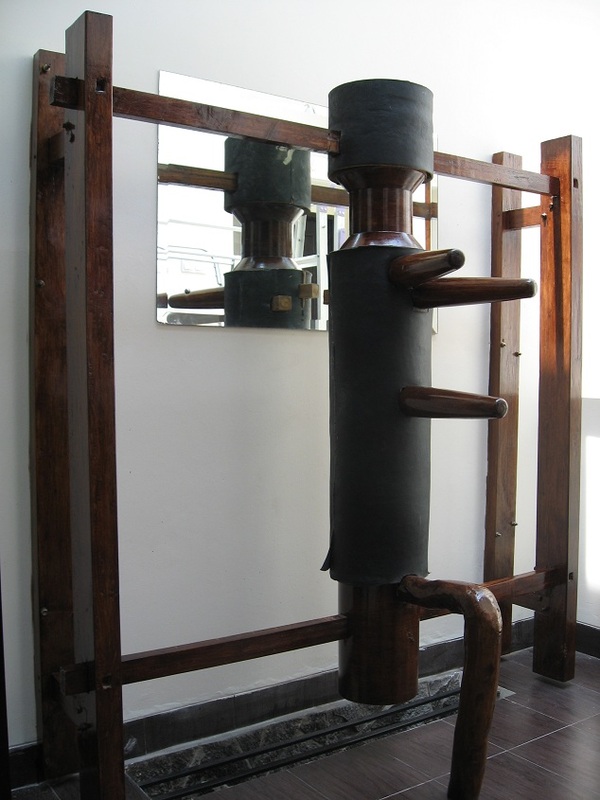 In early days, the late GM Kang Sin Sin made the Muk Yan Jong in the horizontal bar wooden spring form. But the later creation of the late GM Kang Sin Sin’s Muk Yan Jong can also be found in the forms of fixed standing type, iron-made type, spring-arm type, 180 degrees many-arms type, etc. One extraordinary thing that we just realized in the Muk Yan Jong made by the late GM Kang Sin Sin was that the length of the hands of one’s Muk Yan Jong was different from another’s. Frankly speaking, the late GM Kang Sin Sin never measured the length of his disciples’ hands, but it turned out that the length of the Muk Yan Jong’s hands made for us has different hands’ length to suit our own hands. He merely just only practiced Chi Sao with us.